UBT1500 Ultimate Baseball Trainer is the best all around trainer for the beginning player. Perfect for Pitching, Throwing, Fielding, Catching and Hitting! Three trainers for the price of one! 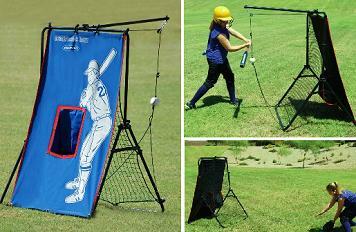 Package includes: frame, pitchback net, throwing canvas, hitting arm, bungees, one baseball assembly plus instructions. Competitive Edge Products, Inc. is an authorized ditributor of Solo Hitter and Solo Sport products. Q: How can I order replacement parts? A: Unfortunately, we do not carry replacement parts for that. Our distributor is no longer in business for that product. Dimensions: 57" x 40" x 5"